I’ve been under-the-proverbial-gun writing to various deadlines these past two months and need to wipe the dust away from this blog soon. “Soon,” however, is not today! 1. 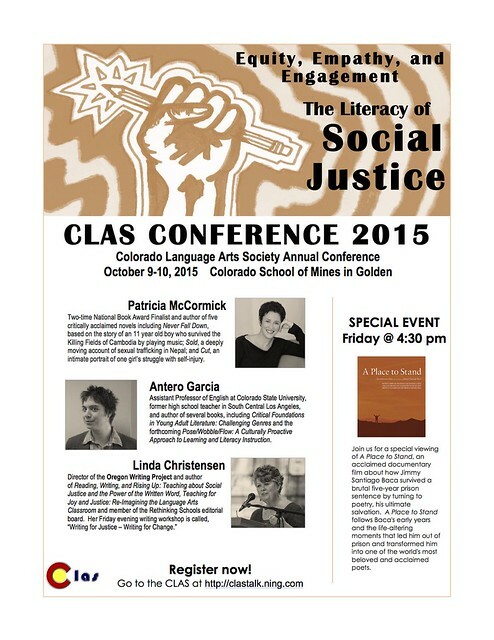 I will be giving a keynote talk at the Colorado Language Arts Conference this weekend alongside a couple of awesome speakers. Check out the flyer below. I’ll also be running a workshop related to key ideas from Pose, Wobble, Flow later in the day. If you’re going to be there, come say hello! You can still register for the conference here. 2. I recently wrote a blog for DMLcentral where I interviewed Jeff Share about critical media literacy and the 2nd edition of his book. Read it here. 3. The Composing Our World project that I am a part of – currently being designed in coordination with teachers throughout Northern Colorado and funded by Lucas Education Research – has a design blog. The blog is very much a work in progress, but will be updated regularly. Interested in learning about our work around Project Based Learning (PBL), Social & Emotional Learning (SEL), and Universal Design for Learning (UDL) in 9th grade ELA classrooms? Follow along with us here! Posted by antero on Tuesday, October 6, 2015, at 8:54 pm. Filed under clips, education, literacy. Follow any responses to this post with its comments RSS feed. You can post a comment or trackback from your blog.